Pumpkins is in style again, at least for the next few months. Don’t just carve, try some of these. 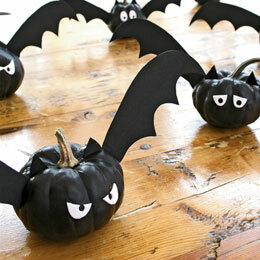 Some link round up of creative things to do with your pumpkin this year. Click on photos for more info and tutorials. Make sure the paint is waterproof or that the pumpkin is sprayed with waterproofing. Sounds silly, but our neighbors painted their pumpkins and the autumn rain washed it all off. It was cool sparkly paint too. Oh! Another idea I saw (I think in Martha Stewart Magazing, October 2009) is to put big pumpkins by your door and stick long, thin branches with autumn-turned leaves into the pumpkin through holes. It looks really cool. I love pumpkin decorating! Those are all really fun! 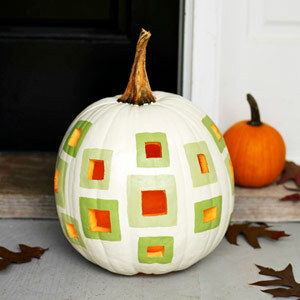 I love to find new ways to make the pumpkins different. Did you see Martha Stewart this year where she used pumpkins and gourds to make mushrooms? That was a fun idea too.